JAPANKURU went to see Japanese wrestling for the first time. I will just give out everything in this game." Why is professional wrestling popular in Japan? We record all of it in this article. 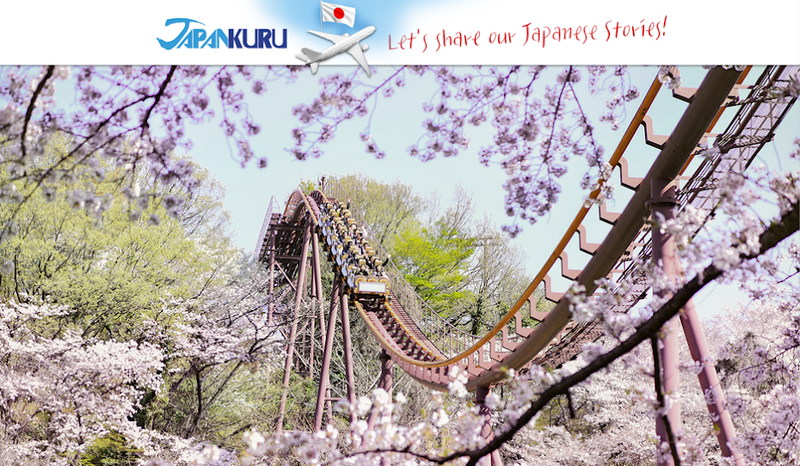 Japan has abundant experiences everywhere. Gourmet such as ramen and sushi are also good, but you’d better have some different experience. 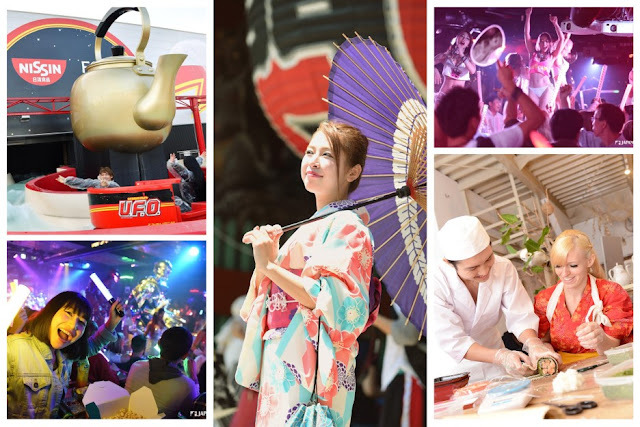 experience such as yukata rental, sightseeing bus around Tokyo, and show at Shinjuku Robot Restaurant. Those performance are quite popular. Not only that. watching baseball games and sumo wrestling etc. Needless to say, Japan is a ”paradise" of entertainment. This time, we would definitely like to show you the real entertainment experience. History of 45 years ”New Japan Pro Wrestling"
”New Japan Pro-Wrestling" founded in 1972 is a representative of Japan Wrestling. New Japan Pro Wrestling Ring established by the world famous wrestler “Inoki Antonio, ” has reached its peak in the 1980s, and ”Akira Maeda" ”Riki Choshu" ”Tiger Mask” started appearing at TV shows became famous stars. After that, the wrestling of the mixed martial arts boom such as K – 1 made wrestling in Japan ceased in a stagnant period. 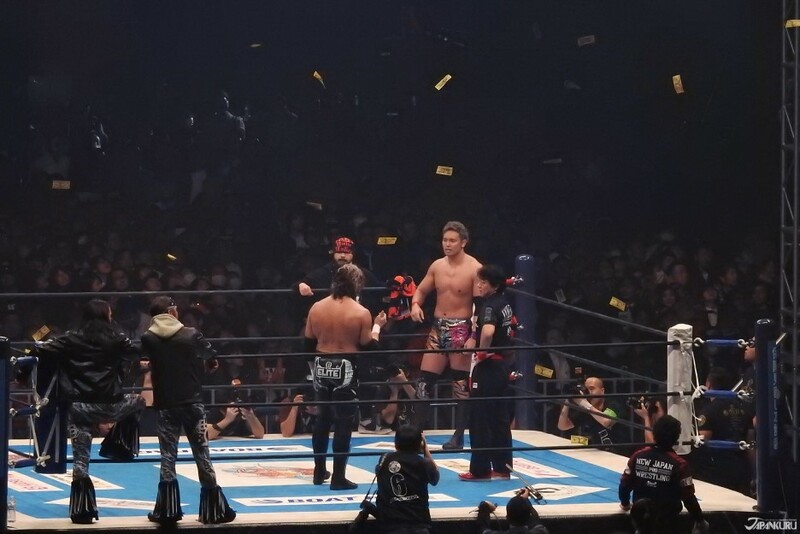 Meanwhile, in the rapidly changing era, the young players of the New Japan Pro Wrestling have continued to persist in the "Wrestling Pro-wrestling Aesthetics.” Now, In 2017 again, the 3rd boom of new pro-wrestling has began in Japan! The charm of wrestling is "aesthetics"
This is the charm of wrestling. Believe the opponent, catch the attack! By trusting and respecting the opponent rather than just hitting the opponent, you will be able to take the attacking technique straightly from avoiding. As you believe others, you stand by for the attacking! If you watch wrestling game after understanding this, your viewpoint will change at all. Female fans are increasing! The reason is? In Japan, regardless of children, women, everyone enjoys professional wrestling as they go watching live concerts and performances. Japan is now in a boom of professional wrestling. Speaking of the existing professional wrestling, it was the image of men, sweat, fresh blood, extreme, scary ... and so on, but now wrestling is cool, healthily muscular, brilliant, respect to partner, effort, tears, and players' stories, young pro-wrestlers' efforts have been reborn and everyone is eager to enjoy the New Pro-wrestling! 1. Powerful act! Brilliant technique! 6. Enjoy eating, drinking and shouting! If you are going to watch a professional wrestling game in your trip to Japan, don’t miss these six points. Totally different enjoyment! Each brilliant technique has its own name. In particular, the star-class players have a “finishing technique” to win the games. There are many difficult names, but all are gorgeous, and really it's amazing to see in real! If all such exquisite techniques were exquisitely calculated, isn’t it a tremendously awesome skill. Wrestlers of New Japan Pro Wrestlers sometimes appear in drama and variety, etc. No doubt they are more popular than the Johnny’s idols. While being surrounded by many audiences, he would show off his wonderful performances with all his strength. Defeat the opponent with a tremendous deathblow, keep both shoulders on the ring and at the same time the referee starts counting. At that moment, while the opponent was thought already defeated, he lifted up one shoulder ~! Capture this impossible moment, stop the counting. That is the instantaneous power of the referee so-called "count of 2.99 seconds" in the world of pro-wrestling. Exquisite "count of 2.99 seconds" is the essential pleasure of wrestling! One of the highlights is the costumes of each players. Especially, preparing all the goods of your favorite players, such as T-shirts, masks, accessories, towels etc. , fan are getting ready at the cheering seat. Their enthusiasm is surely a great force and power for the players. Like you are fighter as your favorite players!!! Wrestlers who are as popular as the Japanese idols! Look at their amazing sales of related goods! T-shirts, caps, and towels are popular items. Get one as a souvenir of your trip to Japan! Nice design! Easy to use everyday! Watching Pro wrestling, there are no difficult rules. Enjoy your heart and body with MAX tension as much as you like! Yes!! like enjoying a LIVE SHOW !!! They also sell snacks and drinks! Just eat, drink and shout and enjoy!!! Get rid of all your stress! Like baseball game! Cheers with beer! "One person's devotion in 100 years" Tanahashi is the leading role who has driven the New Japan Pro Wrestling. 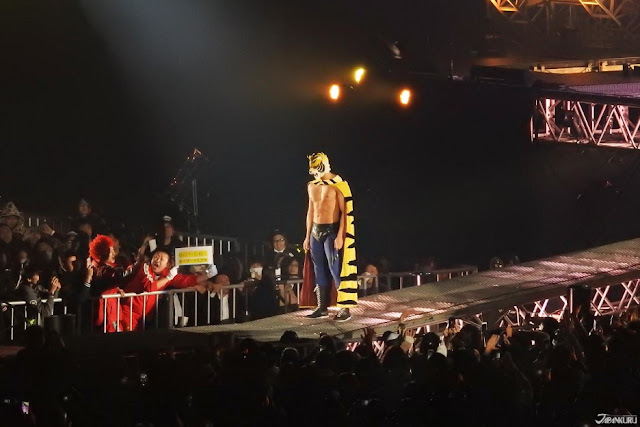 Wearing a handsome mask and having a great body, he says that he keeps standing in the ring every day to protect the sluggish professional wrestling. Faithful to the fundamentals of wrestling, and his elegant and beautiful techniques are said like the real textbooks. "My life is made by me"
At the game in the Tokyo Dome on January 4, 2017, in the introduction video of the players playing in the dark before entering the stage, Tanahashi said that phase! Then, many female fans cheer while he enters the ring. Naito, who is "uncontrollable charisma", enthusiastically find charm for Tanahashi player and enter the to New Japan Pro Wrestling. After learning wrestling in Mexico, he formed a team called ”Los Ingobernables de Japón" in New Japan Pro Wrestling. Finally, beating Tanahashi, hero he was longing for, to get the champion belt. At the Izakaya in Asakusa, the staff showed us the picture and said ”She is the big fan of Naito,” while we were exciting about the topic of new pro wrestling stories. 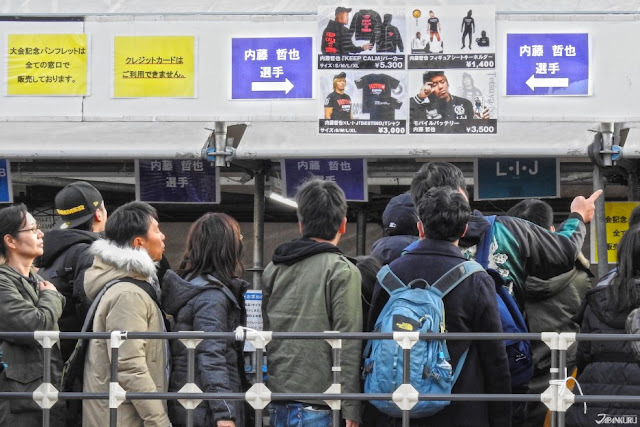 It was a moment when we realized that New Japan Professional Wrestling boom is really attracting female fans in Japan. Actually, he is a popular Wrestler of New Japan Pro-Wrestling. He also decorated the finale of the Tokyo Dome Match on January 4, 2017. 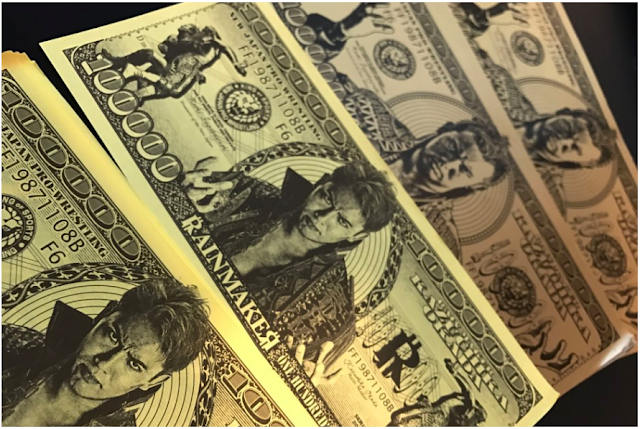 Why keep saying New Japan~ New Japan~ blah blah blah…. Let’s check them out for everyone now! “Dream Ballpark,” which every famous entertainer wants to stand on that stage once. A pro wrestling game will be held only once a year at this "Tokyo Dome," which is used as a baseball field on a regular basis and also loved as a concert hall for domestic and foreign artists. We went to the game on the 4th of January. Only few of the professional wrestling groups in Japan, it seems that only "New Japan Pro-Wrestling" can play in the Tokyo Dome. If you are a pro wrestling fan in Japan, there is no one who does not know the game of Tokyo Dome on January 4, which is called "Ittenyon" (Literally means 1.4, that is January 4). 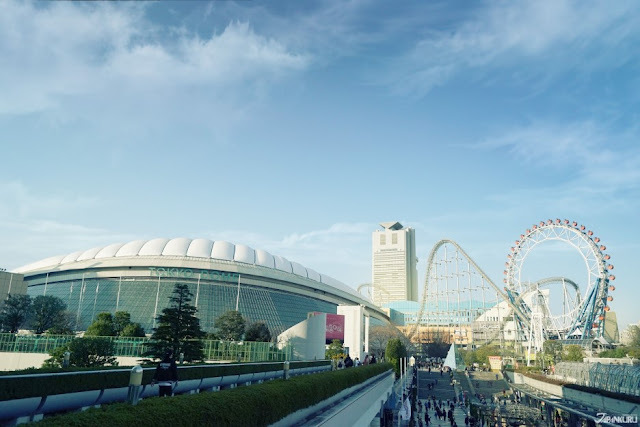 Regular wrestling game can be watched at “Korakuen Hall” next to Tokyo Dome and ”Ryogoku Sumo Hall.” But if you are really interested in, the biggest event “WRESTLE KINGDOM”for wrestling only once a year. It is a big event that can not be missed. The best game! Yes! We watched this Itteyon live during this time. Only once a year “Ittenon,” the biggest events for Pro Wrestling, was held at Tokyo Dome. Fans in cosplay of their favorite players are another point not to be missed! It is a day that a wide variety of fans gather. Costumes of favorite players, fans wearing a self made champion belt, etc. Wrestling's enthusiasm is already big fever in front of the entrance! 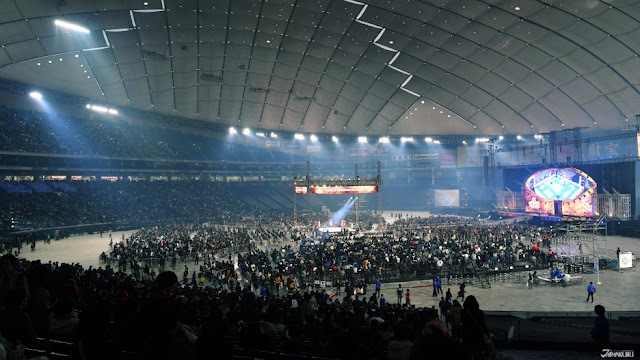 Tokyo Dome also has barrier free seats, so everyone can watch and have fun! The biggest event once a year, that famous players also appeared! Game of Tanahashi player and Naito player whom were introduced above started!! The dome is enormously enthusiastic. No doubt the last match, a brilliant technique indeed! The first experience in our life, a professional wrestling. Easily, it is more fun if you grasp the type of technique , so let us introduce some of them. I think that everyone has seen it once, it is a basic technique that is associated with professional wrestling first. New Japan Pro-Wrestling teaches such "basic" thoroughly, so it is said to be orthodox. This is one of the basic techniques of wrestling. It is also a watching point to see exquisite passive moments of players who are trained. In American wrestling, this technique called "clothesline," is a technique of striking the chest around the opponent's neck with the muscles of the inner arm. This technique is Kazuchika Okada’s Special Move. It can be said that it is a development type of Lariat. The technique of wrestling is extreme of excitement! Especially junior heavyweight is relatively light in weight, so many techniques such as gorgeous aerial rotation will appear. However, that is the charm of pro-wrestling to catch such a painful technique without avoiding it! Tanahashi player who jumped off from the ring corner knocked down to "Kenzan" where Naito knees stood straight. "Grab your opponent's skills brilliantly ..." If you look closely, you can understand. A technique called a buoy trigger. Attacker "Kenny" is good at sport. This is also his deathblow technique. When this technique begins, it seems to call "Go to Hell" all at once from the audience seats. It is outside outside. It is enough to worry a little while watching players “flying” sometimes. Those are their technique though. Whenever a player who stays in front of the player without escaping such opponent's technique, there is something unexplainable in words! The real thrill of wrestling is being knocked down beyond the playing field. Your own safety is second!! Believe in opponent players and showcase brilliant techniques, literally ”"wrestling" of the "pro" !!! Now, Japan is in a professional wrestling boom. Watching the first wrestling game of life. Being fan of Combat sports, we were not pretty interested in professional wrestling honestly. But … this time, we felt that we watched a real match. "Aesthetics" of such wrestling can never be tasted in other sports. For wrestlers competing with each other on a ring, they are professional enough to respond to the crowd of the audience! Isn’t it real and live? Are you interested in watch "Wrestling" while traveling in Japan? 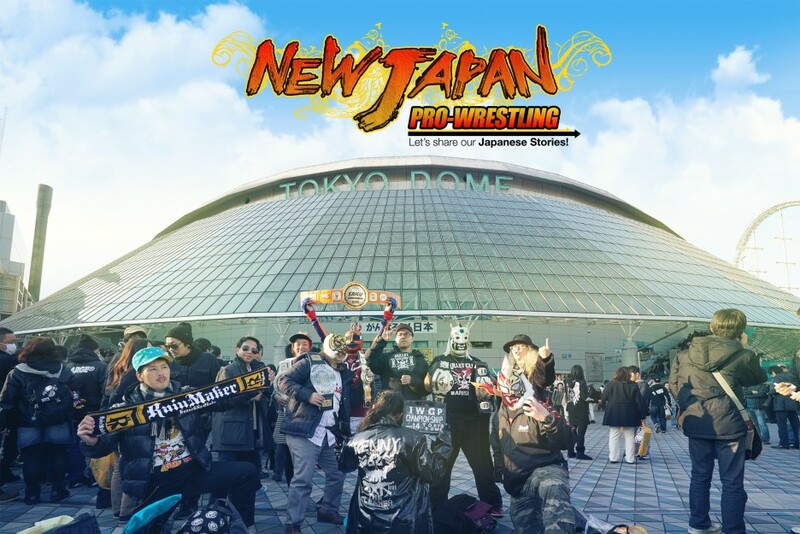 >>New Japan Pro- Wrestling English website has opened!